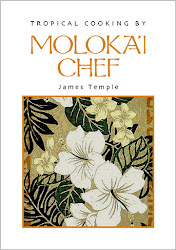 Tasting Hawai'i With Moloka'i Chef James Temple: DILL-icious DILL! 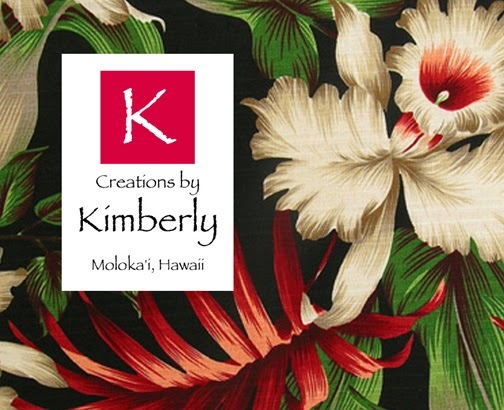 Dill leaves, also known as dill weed, grows quite nicely here in Hawaii, and I have found that it is an excellent ingredient in many recipes. 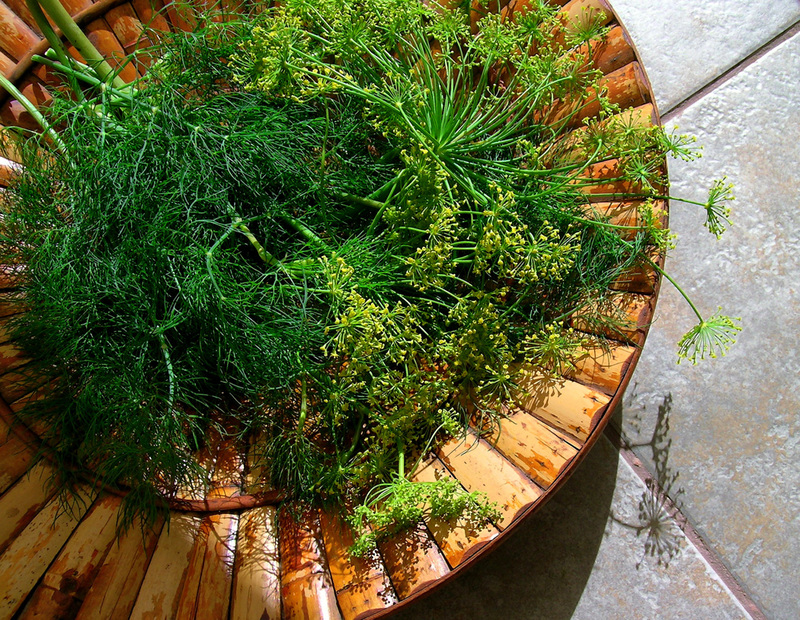 You can buy fresh dill and other herbs at Kumu Farms on Moloka'i, or you can easily grow dill yourself from seeds. It only takes a couple of weeks before you will have more dill plants than you know what to do with. One of our local grocery stores, Friendly Market, sells seed packets of the "Dukat" variety from Renee's Garden , a seed company in California, for $2.79, which is the same price as you can buy them for online. The photo above is the dill I grew from these seeds. 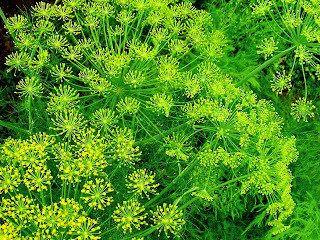 Dill (Anethum graveolens) is a green herb with wiry, thread-like leaves that grow in clusters. It has a distinctive taste that is like a combination of fennel, anise and celery, with warm, slightly bitter undertones. It is a native of Southern Europe and Western Asia. 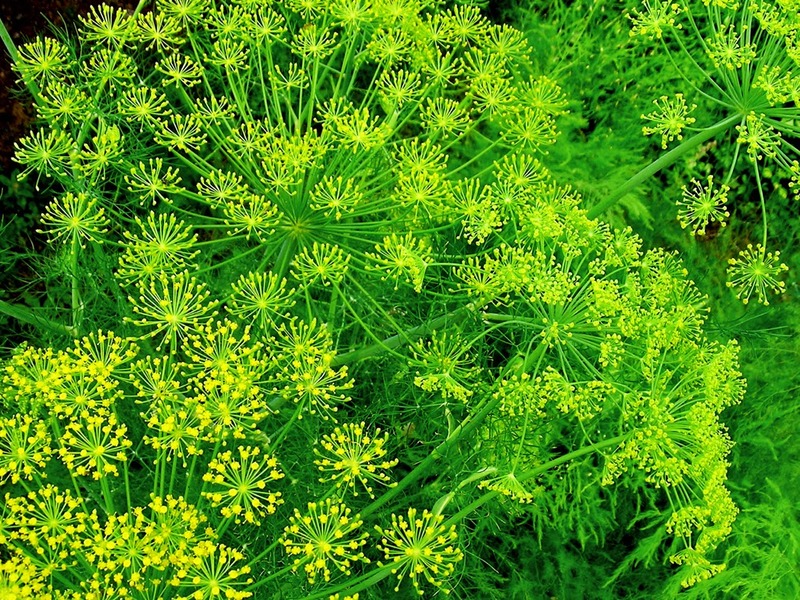 Although the origin of the name dill is debatable, it is believed to have originated from the Norse word "dilla", or Anglo Saxon "dylle", meaning "to lull or soothe". It is an ancient herb that was listed by the Egyptians as an herb 5,000 years ago. In the Bible it was so prized that it was listed in the Gospel of St. Matthew, as an herb suitable of payment for taxes, along with mint and cumin. During the Middle Ages dill was woven into garlands and worn around the neck to ward off witches and their spells. Dill was a traditional remedy for stomach aches, gas and colic in babies and children. It has been a popular remedy for upset stomach, hiccups and insomnia. The fresh herb is known for its ability to improve appetite and digestion. Dill is wonderful in many recipes, and is widely eaten all over the world. 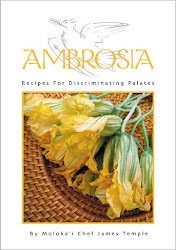 While not as readily used in American cooking, it is a traditional favorite in Greek, Russian, Lebanese, Scandinavian, and Syrian recipes. Sprinkle on steamed vegetables, sliced tomatoes and cucumbers, in mixed green salads and dressings, in sauces and, most deliciously, over grilled or poached salmon and other fish. You will notice butterflies in your garden if you grow your own dill, they love the nectar from the delicate yellow flowers (see photo above). You can even harvest the pungent seed heads to season soups and pickles. Dill seeds can be toasted, fried, or cooked in broths. You don't have to grind them because their high surface area allows them to plump up and become tender very quickly. They are perfect for covering up funky, undesirable flavors in gamey meats or sulfurous cabbages. This is an Old World spice just waiting for some New World applications. Dill seeds are high in calcium (a single tablespoon contains more than eight ounces of milk). In a large saucepan saute onion and garlic in oil and butter until tender. Add the tomatoes, salt and pepper; cook over medium-high heat for 3 minutes or until heated through. Remove from the heat and stir in tomato paste. In a small bowl, combine flour and 1/2 cup of water; stir until smooth. Stir into saucepan. Gradually stir in remaining water until smooth; bring to a boil over medium heat. Cook and stir for 2 minutes or until thickened. Place mixture in a sieve over a large bowl. With the back of a spoon, press vegetables through the sieve to remove seeds and skin; return puree to pan. Add cream and dill; cook over low heat just until heated through (do not boil). Garnish with chopped hard cooked eggs and fresh dill sprigs. Makes 4 servings (1 quart). Saute the onions celery, and carrots in the oil over medium heat for 10 minutes. Add the garlic, potatoes, cabbage, salt and pepper. Continue to saute for another 10 minutes over medium-low heat. Add the remaining ingredients. Bring to a boil and then simmer for 20 minutes (or until the potatoes are tender). Stir in the dry potato flakes to thicken the soup. Season to taste. Pour soup into bowls and garnish with chopped dill. Makes 10 servings. Pour the water into large mixing bowl. Add the sugar and let dissolve. Add the yeast and let dissolve. Beat in the egg and vegetable oil. Add the minced onion and dill and mix well with wooden spoon. Add the flour and salt, and mix with large wooden spoon until the dough is elastic and smooth. Cover and let rise for about 1 hour. Drop the dough into a greased muffin tin, filling each cup half full. Cover the muffin tin, and let rise again until doubled. Beat an egg, and lightly use pastry brush on top of each roll.. Not too much egg. Bake in at 375˚F oven betwen 15-20 minutes, until golden. Makes 12 servings. Note: You don't want to use regular cucumbers that have been waxed. Use FRESH pickling cucumbers. 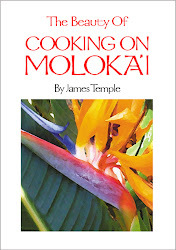 Here on Moloka'i we can't get pickling cucumbers, so I use Japanese cucumbers, they are crisper than regular cucumbers and work fine. Boil the water, vinegar, sugar, and salt in a saucepan. Cool. Add cucumbers, garlic, and dill in a plastic or glass bowl (not metal!). Cover with the cooled liquid. Put in the refrigerator for 3 to 4 days. The pickles should be good for 6 weeks. Makes 4 cups. In a small bowl, whisk the first eight ingredients. Stir in tuna and onion. Serve over spinach. Garnish with tomato slices. Makes 2 servings. In a small mixing bowl, combine milk, sour cream, mayonnaise, garlic, and dill. Add half the blue cheese and mix together, using the backside of a spoon to mash the blue cheese into the mixture. Some chunks of blue cheese should remain. Add the chives, or scallions, and season with salt and pepper, stir to combine. Cover and refrigerate for at least one hour before serving. Cut the cold iceberg lettuce into quarters. Place a wedge of the lettuce in the center of the cold plate and generously spoon the chunky blue cheese dressing over the wedge of lettuce, sprinkled with the other half of the crumbled blue cheese and the cherry tomato halves. Serve with a cold knife and fork. Makes about 1 1/2 cups of dressing, enough for 4 salads. Note: If you like the dressing a little thinner, simply add a little more milk and stir. Puree the cucumbers in a food processor or blender. Add the remaining ingredients and blend just until incorporated. Adjust the seasoning with sugar, salt and pepper. Serve immediately or refrigerate for later. Serve over sliced tomatoes garnished with dill. Also great with poached salmon. Makes 2 cups. Place beans in a steamer basket; place in a large saucepan over 1 in. of water. Bring to a boil; cover and steam for 8-10 minutes or until crisp-tender. In a jar with a tight-fitting lid, combine the lemon juice, oil, dill and salt; shake well. Transfer beans to a serving dish; add dressing and toss to coat. Makes 6 servings. Melt the butter in a medium-size skillet or saute pan over medium heat. Add radishes and toss to coat with the butter. Cover the pan and cook for 4 minutes, shaking occasionally. Add the sugar and vinegar and toss over mediom heat for 1 minute. Sprinkle with dill and season to taste with pepper. Serve immediately. Makes six servings. Put scrubbed potatoes in a pot with water to just cover. Add salt and the stems from the bunch of dill. Bring the water to boil with the lid on. Lower the heat and boil for 5-7 minutes until the potatoes are cooked through. Pour off the water and dill stems. Add the butter and chopped dill leaves, toss and serve with black pepper. Makes 4 servings. Boil the soy beans or lima beans separately in little water and salt for about 8 minutes. Drain the water and set the beans aside. Take a big plate and spread out the cooked rice making sure there are no lumps. Add turmeric, chopped dill leaves, a little oil, mix well and set aside. Note: This step is important, mixing the dill to the rice and then adding the combination to the cooked onions. Adding dill directly to heat, removes its flavor. Hence it is best to combine with rice and cook it as this retains its texture and imparts good flavor to the rice. Take a heavy bottom pan or wok, add a little oil on medium heat. Add mustard seeds and let it splutter, add the grated garlic and stir until it turns light brown. Now add the green chili and the chopped onions and fry until it gets transparent. Add the rice mixture and stir it thoroughly. Cover with lid and let it sit for a 5 minutes. Finally add the juice of a lemon. Mix well. Serve hot. Note: Make sure to add the lemon juice when the prepared rice has cooled down a little, or else it tends to add sourness to the rice. Makes 4 servings. Thinly sliced beef with a light coating of Dijon mustard, topped with a slice of bacon and dill pickles. Cook pasta in large pot of boiling salted water until just tender but still firm to bite. Drain well; return to same pot. Combine half-n-half, dill, onions, capers, and lemon peel in heavy small saucepan. Bring to boil over medium-high heat. Add sauce to pasta; toss to coat. Add salmon and toss to combine. Season with salt and pepper and serve. Makes 2 servings. In a large skillet or wok, add olive oil with garlic and onion and wine on medium heat for about 5 minutes! add the rest of the ingrediants! stir every 30 seconds until done. 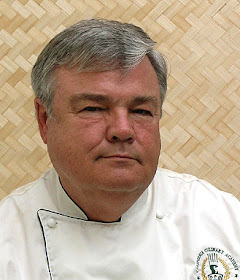 Serve with hush puppies and pickled okra on the side. Makes 4 servings. Combine sour cream, yogurt, mayonnaise, mustard, and hot sauce. Stir in dill then add salt and pepper to taste. Blend well. Allow to stand at least 1/2 hour to blend flavors. Pat mahi-mahi steaks dry with paper towels. Combine oil and lemon juice and brush on both sides of steaks. Season lightly with salt and white pepper. Place an inch apart in a lightly oiled baking dish. Bake at 450˚F for approximately 15 minutes. Serve mahi-mahi steaks with dill sauce over steaks sprinkled with a dash of fresh dill atop each. Makes 2 servings.